Step 1 Boil the celeriac in salted water until tender, then drain well and use a stick blender to mash to a smooth purée. Season well with salt and pepper. Mix in the dill. Step 2 Put the fish in a pan with the milk and bay leaf. Slowly bring to a simmer. When the fish is just flaking, lift it out (keep the milk) and lay it on a plate. When cool enough to handle, remove the skin and bones. Step 3 Preheat the oven to 180C/Gas 4. Step 4 Melt a teaspoon of the butter in a medium-sized pan and add the leeks and garlic. Cook until soft. Scoop out and keep to one side. Step 5 Melt 20g of the butter, stir in the flour and cook for a minute before gradually whisking in the fishy milk to make a smooth sauce. Mix in the mustard then gently fold in the fish, peas, and leeks. Taste and add seasoning. Step 6 Pile the mixture into a dish. 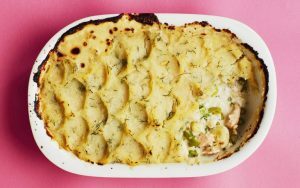 Top with the celeriac-dill mash. Melt the final teaspoon of butter and brush the top of the pie with it. Bake for 30 minutes until browned and hot through.